(NAPSI)—Holiday visitors and family celebrations often encourage home updates in order to prepare for the season’s festivities. • Offer your visitors a warm welcome. A newly painted front door will create a lasting first impression for guests. When choosing a color for your door, take cues from the exterior of your home—the walkway, the roof color and the overall feel of the neighborhood; these elements will help guide your decision. Bright, vibrant colors add an artistic touch to your home while softer, subtle shades, like Pratt & Lambert Timeless Gray, bring a classic elegance. Whatever color you decide on, your updated door will create instant curb appeal, showcase individual style and give a welcome greeting to holiday visitors. • Limit projects during the holidays. Instead of taking on a larger project like updating an entire room, showcase your individual style with an accent wall. When choosing an accent color, take inspiration from your environment and use it as an opportunity to create a harmonious look to your home. • Create a focal point in the room with a furniture update. During holiday gatherings, guests will congregate around the delicious fare being served. By updating your buffet or hutch with a fresh paint color, the room will instantly be transformed and refreshed. Try a bold color like Pratt & Lambert Jungle, a unique green shade, for a true statement. • Prepare the guest room for holiday visitors. Create a comfortable and luxurious experience for your guests with highly designed yet warm decor. Paint the guest room headboard in a bold shade and add an unexpected pop of color to the interior of a bookshelf. Add a floral arrangement and scented candles for a hotel-like feel. • Holiday-themed colors will continue to inspire all year long. If holiday colors like cranberry and pine are a source of inspiration, consider classic hues that are on trend regardless of the season. Pratt & Lambert Velvet Red and Pratt & Lambert Shaded Spruce will give a sense of richness during the holidays but also add a distinguished aesthetic for many years to come. 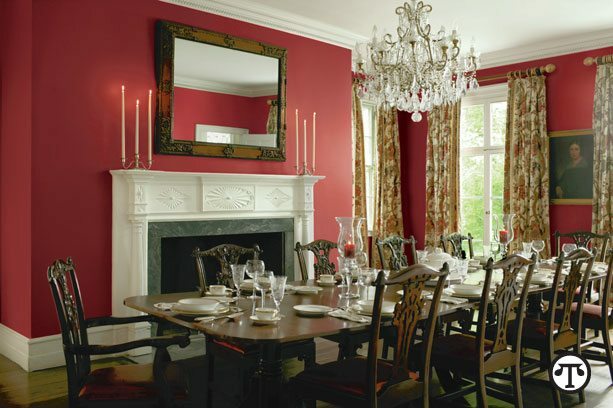 You can find more color options and trends among Pratt & Lambert premium interior paints. Since its founding in 1849, the company has stood for quality, leadership and innovation in the paint industry. For further facts on home decor, go to www.prattandlambert.com.